The Mask, also known as Masque, Big Head, Smokin'! and Jim Carrey, was an ancient artefact from Norway originally created in it's battle for freedom from Sweden. The object was so famous that it received its own comic-strip, TV series and two films. During a fight with Thor and Captain America, the god of Trickery and Dynamite, Loki, became trapped in a magical wooden mask. Whoever wore the mask would become possessed by Loki and cause mischief and mayhem that would sometimes even result in death. 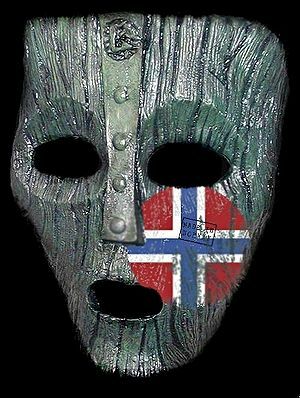 Seeing the power of the Mask, the Norweigans dropped it in Sweden undercover of darkness in an attempt to cause trouble in Stockholm. The Mask did so whilst possessing Karl Karlsen, the founder of PBS. The damage inflicted was horrendous, leading to thousands of deaths. Completely unaware that it was a product of Norway, despite the plaque on the side that said "MADE IN NORWAY". Eager to get The Mask off their hands, Sweden dumped The Mask on a round-the-world cruise, where it stayed until it was dumped in a river outside Edge City, Alabama. During this time, a turtle caught hold of The Mask that led to several deaths along the Coral Reef. After the Turtle died of a cardiac arrest, the Mask floated to the surface and was picked up by neurotic Stanley Ipkiss, who caused a wave of terror unseen in America since the era of Howard the Duck. Eventually, Ipkiss died and the Mask was kept locked away in super-tight security at a maximum-security army base somewhere in Nevada, where it remains today. But even so, the ailing comic-book industry had a field day with the new idea. Two films were made about the Mask, though they had practically nothing in common with the comics or the real Mask. The Mask (1996) - A film version of The Mask was released in the United States on July 29, 1994, starring Jim Carrey in the title role. Directed by Chuck Russell, the film co-starred Peter Greene as Dorian Tyrell, Peter Riegert as Lt. Mitch Kellaway, Orestes Matacena as Niko, Richard Jeni as Charlie Schumacher, Amy Yasbeck as Peggy Brandt, and Cameron Diaz, in her screen debut, as Tina Carlyle. Ben Stein has a cameo role as Dr. Arthur Neuman. While there were early efforts to take the movie in the direction of horror (some at New Line Cinema saw it as a replacement for their fading Nightmare On Elm Street franchise), it was never completely intended as a "dark horror" picture. New Line had problems coming up with a script that could show violence that was comical, but had more success with a story that had comedy that was violent. Richardson always pushed in the direction of the Tex Avery concept which was eventually adopted, despite the efforts of several potential directors, including, initially, Chuck Russell, to make the move to horror. Richardson also resisted early attempts to attach both Martin Short and Rick Moranis to the lead role. Mike Deluca's suggestion of Jim Carrey for the lead, together with Mark Verheiden's "Cuban Pete" production number, set the final tone for the film. The plot of the film was loosely based on the first half of the Arcudi/Mahnke comic book miniseries. It uses only a few scenes from the comic, including the scenes of the muffler mechanics and the street gang and balloon animals. Mike Richardson's comic origin for the character came from the ancestor worship of ancient Africans that formed the basis for the voodoo that came centuries later. In the film, however, the Loki-based origin was grafted on in Chuck Russell's screenplay. A deleted scene is featured on the DVD, where a band of Vikings drag a chest containing the mask onto the shore of North America which was also depicted in the Dark Horse Comics two-part comic book adaptation of the film. The Mask: Animated Series The movie version of the character subsequently appeared in an animated TV series entitled The Mask: The Animated Series (with Jim Carrey as Stanley Ipkiss/The Mask) and his own short-run comic book series based upon the TV show, Adventures of The Mask. John Arcudi wrote season one's "How Much is That Dog in the Tin Can" and season three's "The Goofalotatots" (a parody of Warner Bros.' Animaniacs). Much as with the Beetlejuice cartoon before it, The Mask TAS took many elements from the source movie but made numerous changes. Tina was absent, and reporter Peggy Brandt had become the main female character but not love interest. Also unlike in the movie, Ipkiss appeared to be able to use the mask in daytime as well as at night. In one episode, Jim's other character, Ace Ventura (voiced by Michael Hall), makes a crossover guest appearance, and vice versa. Four VHS volumes of the series were released (an extra two were released in Australia), all of which are now out of print. Upon the initial DVD release of the Son of the Mask, Wal-Mart stores sold an exclusive 2-pack of the movie with two episodes of the animated series ("The Mask Is Always Greener On Other Side" Parts 1&2). As of 2009, this is the only DVD release of the series.